Emirates Holiday are passionate about creating your perfect holiday, featuring destinations globally. From white sandy beaches to romatic retreats, its never too late for a last minute holiday all wrapped up with flights on award-winning Emirates. Start planningStart planning your next holiday Opens an external website in a new tab. Earn Skywards Miles when you book with Emirates Holidays in addition to the Miles earned on your Emirates flight. You can also redeem Miles against your Emirates Holidays package in the UAE, UK, Republic of Ireland, Saudi Arabia and USA. Global except United Kingdom, Republic of Ireland, Denmark and Sweden: Earn 20% bonus Miles when you book a minimum three nights' Emirates Holidays package. United Kingdom: Earn 1 Skywards Mile for every GBP 3 spent on your Emirates Holidays package, in addition to the Miles earned from your Emirates flight. Republic of Ireland: Earn 1 Skywards Mile for every EUR 3 spent on your Emirates Holidays package, in addition to the Miles earned from your Emirates flight. Denmark and Sweden: Earn 1 Skywards Mile for every DKK 25 or 1 Mile for every SEK 35 spent on your Emirates Holidays package, in addition to the Miles earned from your Emirates flight. 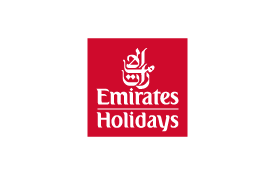 When booking from the UAE, UK, Republic of Ireland, Saudi Arabia, USA, Denmark and Sweden, you can put your Skywards Miles towards Emirates Holidays packages. For every 5,000 Miles you redeem, you’ll get AED 110* off your package. And there’s no limit to the number of Miles you can redeem. You can choose to pay using Miles or with a combination of Cash+ Miles. Remember to quote your Emirates Skywards membership number. Specific redemption terms and conditions apply in the UAE. All rewards must be booked via call centre. Please click here to see contact number and view terms and conditions. Specific redemption terms and conditions apply in the UK. All rewards must be booked via call centre. Please click here to see contact number and view terms and conditions. Specific redemption terms and conditions apply in the Republic of Ireland. All rewards must be booked via call centre. Please click here to see contact number and view terms and conditions. Specific redemption terms and conditions apply in Saudi Arabia. Please click here to see contact number and view terms and conditions. Specific redemption terms and conditions apply in the USA. Please click here to see contact number and view terms and conditions. Specific redemption terms and conditions apply in Denmark. All rewards must be booked via call centre. Please click here to see contact number and view terms and conditions. Specific redemption terms and conditions apply in Sweden. All rewards must be booked via call centre. Please click here to see contact number and view terms and conditions.